Blue pin markers represent actual service calls. Over 400 homes in the Roswell GA area. Throughout Roswell, GA, there is one garage door service team that homeowners trust more than anyone else in the business: CSS Garage Doors & Openers. Our team has been owned and operated in the Atlanta area for decades, so we have the experience and precision to craft a garage door that enhances the look of your home at an affordable price. Why should you choose CSS Garage Doors? The simplest answer is our commitment to customer satisfaction. On review sites across the web, we have achieved hundreds of five-star ratings from real-life customers. Our success is attributed to one thing only: never finishing the job until you are completely happy with the results. Our straightforward pricing guarantee also means that your final bill isn’t filled with hidden costs or charges. For any Roswell homeowners, we develop a garage door plan that keeps you in budget while still providing the best products and service available. To check out some of our results, check out the CSS Garage Door photo gallery or simply ask a neighbor. Our licensed and insured staff takes a personable approach with every customer and our business is predicated on the long-term reliability of your garage door. If you ever encounter a problem with your CSS-installed garage door, simply give us a call and we will promptly correct it. At CSS Garage Doors, garage door repair & garage door opener repair specialists, we repair all makes and models of residential and commercial garage doors and openers. Roswell garage door repair & Roswell garage door opener repair is our specialty. At CSS Garage Doors, we never cut corners. We want your garage door to work smoothly and safely. When it comes to Roswell garage door repair and garage door opener repair, we do it all from off track doors, torsion spring replacement, roller replacement, automatic garage door opener repair, or replacing garage door sections. Garage doors are the largest moving part of a house and can be very heavy, often going years without proper maintenance. These days people use their garage door more than ever. When your overhead garage door breaks it is important to have it fixed right, or you will wind up with serious problems in the future. It is laughable what some garage door companies would consider good garage door repair, but at CSS Garage Doors we guarantee we will do the job right. We’ll get the job done right the first time. We are the #1 Roswell garage door repair professionals with many years of experience repairing garage doors the right way. With garage door opener repair & installation, CSS Garage Doors can repair your current garage door opener or install a new one. Our employees will show up with a fully stocked truck with the most common replacement opener parts such as circuit boards, gears, trolleys,capacitors, and new automatic garage door openers. Call us today for automatic openers and garage door opener repair. Garage door openers are no longer considered a luxury item, but have become a standard part of a home or business’s access and security. Garage door openers do not just open and close overhead garage doors, but they also make for a good locking system. It is also common to use the garage door for routine trips in and out of the house. For this reason automatic garage doors require more maintenance and repairs than ever before. When you push that button and your door won’t open or close it can be a major problem. It is impossible to drive to the office when your car is stuck inside the garage, and who can sleep comfortably at night knowing that the garage door won’t close. 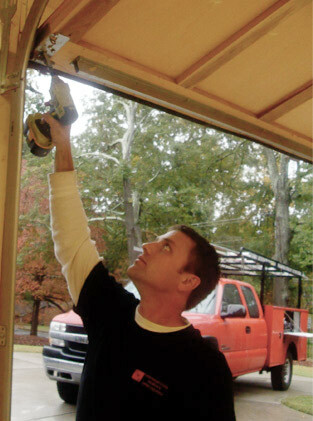 At CSS Garage Doors we install and perform garage door opener repair in Roswell and surrounding areas. Garage door torsion springs will all eventually break due to years of stress. We offer around the clock garage door repair and torsion spring replacement because broken springs can leave your car stuck in the garage. Torsion spring replacement is not rocket science, but it is a detailed and dangerous job that should not be attempted by anybody except the professionals at CSS Garage Doors! If you need Roswell garage door repair and you are in need of torsion spring replacement, it is not recommended to use the automatic opener until the springs are replaced. Garage door openers are not made to lift the weight of a garage door and they will break when lifting too heavy a load. The torsion springs carry the weight of the door and when springs break they have to be replaced before you can use the automatic opener. Many homeowners are injured every year while attempting to repair torsion springs. Springs have a tremendous amount of stored energy which can be released quickly and violently. Never tamper with any part of a garage door while it is under tension from the springs. All springs break eventually and will have to be replaced. At CSS Garage Doors we stock enough springs to repair any residential job on the spot. Many companies do not stock enough springs and would rather put the wrong spring size on a door rather than making a second trip. A garage door with the wrong springs will not last long and will soon have to be repaired or even replaced. It is important to choose a company that cares enough to do the job right. When it comes to our springs, we use high life cycle springs which will give your more value for your hard earned dollar. Call CSS Garage Doors for torsion spring replacement in Roswell and surrounding areas. You do not have to wait until your car is stuck in your garage to have it checked out. In fact, regular maintenance on your door system can save you money over the long haul while bringing you peace of mind. Overhead garage doors (also known as sectional roll up doors) have many moving parts (bearings, rollers, pulleys, cables, extension springs, and torsion springs) and are often used frequently throughout the day. If you are wondering if your door needs a little TLC, here are some tips to help you decide if your Roswell home needs garage door repair. 1Inspect: Look over your door. As some parts wear down, they stretch, crack, wobble, or fray before they break. The bolts and screws holding everything together can loosen over time. The sections of the door can rot, separate, and fall apart. If something looks out of place to you, have it checked out. Do not touch your door parts as you do this. 2Listen: A noisy door system is more than just annoying. If your door is getting louder it is trying to tell you something. Every sound is a vibration; often caused by grinding, scraping, and harmful friction. Not every noise coming from your door indicates you need garage door repair, but if your door is turning into a dreadful symphony that wakes the neighbor’s dogs, you should have it checked out. 3Watch: If your door is bouncing, shimmying, and shaking its way shut, it should be looked at. It is hard on your opener because it does not know how to adjust for sudden changes in pressure, and it runs a higher risk of jamming when it is not moving in a consistent pattern. These jams can often lead to catastrophic failure in your door system that has the potential of damaging even heavy duty door sections. 4Feel: It is easy to take your garage door opener for granted. We hit that button day after day and we expect it to go up without a hitch. Consider giving it a break every once in a while and operate it the old-fashioned way. If it takes a big effort to get it up or down by hand, your door is out of balance. Standard residential doors can weigh well over 300 pounds and your opener is not designed to be the muscle of the operation. While the torque on most units can be adjusted, maximizing these settings is not safe and will eventually compound the real problem with additional repairs. For safety reasons, you never want to pull the opener disconnect while the door is in the up position.